The ARO FDA-compliant pump now features a single-piece diaphragm with an over-molded design. ARO the fluid intelligence experts, announced two key enhancements to its line of FDA-compliant diaphragm pumps. 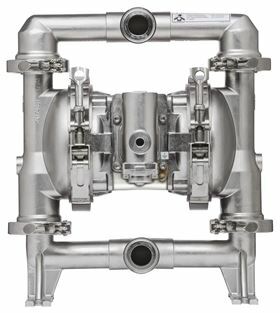 Designed for food and beverage, pharmaceutical and cosmetics manufacturing applications, the ARO FDA-compliant pump now features a single-piece diaphragm with an over-molded design which allows for easier cleaning and prevents material from building-up in between the diaphragm and washer which is exposed to fluids. All ARO FDA-compliant pumps now come standard with electronic interface capabilities so they are automation ready for increased efficiency. Along with the useful one-piece diaphragm design, the ARO FDA-compliant pumps now come with an electronic interface capability to support batching, end-of-stroke detection and remote monitoring. The electronic interface is compatible with the ARO Controller and other control devices. This compatibility supports automated batching and accurate control of the pump in a variety of applications, including transferring anything from juices and beer, to more viscous products such as peanut butter (when used with a follower plate). Deploying automated processes also saves manufacturers time by freeing operators from having to stand over the pump, increasing their overall productivity. ARO FDA-compliant pumps yield 20 to 30% better flow rates than other pumps on the market. The center body of the pump can be configured with polypropylene or stainless steel. The pump’s wetted and non-wetted components are manufactured with electropolished stainless steel to ensure careful transfer, while maintaining the integrity and purity of the material being transferred. The ARO FDA-compliant pump is available in one-inch and two-inch sizes. The one-inch pump yields a maximum flow rate of 54 gallons per minute (gpm) (204.4 liters per minute) and the two-inch yields a maximum flow rate of 192.7 gpm (729.4 lpm). ARO showcases new pump and control technologies at ACHEMA 2015. Ingersoll Rand has expanded its range of ARO smart solutions with the new SD line of FDA-compliant diaphragm pumps. Ingersoll Rand has expanded its pump production capacity at its manufacturing facility in Guilin, China.